Opening with a fascinating introduction to the rich culinary history, culture and traditions of the Turkish people, Ghillie Basan describes how years of war and migration have helped to shape the modern cuisine, from early nomadic Anatolian tribal practices through the dazzling Ottoman period to the modern table. 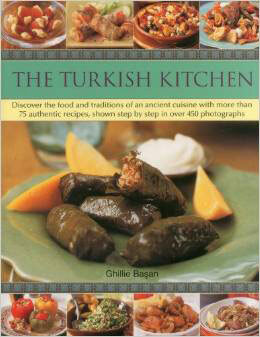 Then follows a comprehensive guide to the equipment, ingredients and techniques used in the Turkish kitchen, including step-by-step sequences to explain the processes clearly. Beautifully illustrated with more than 450 photographs, and complete the nutritional notes, cook’s tips and variations, this stunning book provides a tantalizing insight to an ancient and diverse cuisine.